Barns Green enjoyed a 31-7 win against Newick away on Saturday. Early exchanges saw Barns Green on the front foot and although dominating possession and territory for the first quarter they found the physical home defence difficult to unlock. Barns Green almost opened the scoring when awarded a penalty 35m out but unfortunately Hoyte hit the upright and although Newick had their clearing kick charged down the ball bounced dead before the attack arrived. It wasn’t long before Newick found their attacking lines and it took some stout defence to prevent them scoring before Barns Green scored their first try. It took a touch of magic for the visitors to open their account, a loose Newick pass 10m from the Barns Green line was fed out to Pete Salked on the wing who made 15m before chipping the ball forward cleverly keeping it in play, for Matt Sprigge to collect and pass to Matt Hoyte who, producing some silky evasive running from 40 out, beat defenders at will to collect the first seven points of the game. A turning point in the game coincided from the resulting restart, the visitors benefiting from a poor Newick restart that didn’t go 10m. At the resulting scrum a quick strike allowed scrum half George Wilson to snipe around the blind side where his pass found Matt Sprigge sprinting down the line to score near the corner. BG narrowly missing the conversion. If the visitors second score was fortuitous then the third was anything but, forwards and backs combining well to work through many phases. Strong carries from Tom Viney, Matt Stone & Ross Young eventually created the hole for the imperious Dino Karaioakeim to cap a fine display with a well deserved score. Barns Green were at this stage dominant with the visitors struggling with the heat and the pace of the game. As the hosts lost their shape in defence Matt Sprigge spotted a mismatch in the home defence to pick off a number of defenders to coast in under the posts to give the visitors a 24-0 lead. As the half draw to its conclusion Newick’s power game seemed to click and the half finished with the hosts attacking the visitors line but they were repelled, Barns Green were probably glad of the whistle despite dominating the half. Barns Green knew that the proverbial kitchen sink would be thrown at them at the start of the second period. Newick were assisted by some sloppy indiscipline by the visitors and after 3 quick penalties in succession the hosts crossed the white wash to gain a foot hold in the game. A game of attrition was now played between the twenty two’s, the hosts looking to go multiphase through strong forward surges and the visitors looking to put width on the ball in the search of some soft shoulders in the wider channels. Salkeld, Jarvis and debutant Quinn all made some strong runs from deep but the hosts were able to turn over a number of breakdowns as the visitor support was found wanting at times. Although neither side was able to press their ascendancy in the second half the game was settled with a sublime piece of skill from Hoyte once again. Having received the ball in limited space he spotted that the full back was not at home, grubbed in a deft chip to collect and round the winger for a converted score. For the remainder of the game the visitors struggled with the referees interpretation of the breakdown perhaps reinforced by the 10 second half penalties they gave away. 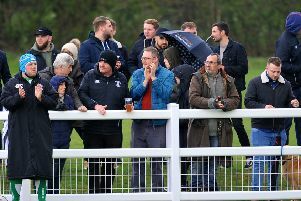 Newick stuck to their task and perhaps showed their potential threat when the weather deteriorates later in the season with their ruck and drive game. Coach Neil Bailey will surely be delighted with his charges efforts after the first two games. Two away wins with a squad not yet at full strength shows that his team has more strength in depth than perhaps expected in pre season. Barns Green entertain St Jacques of Guernsey next Saturday in what will be the first of their VP lunches. Anyone interested in attending the lunch should contact Alan Lambkin.